The judge in the reopened case had originally scheduled a hearing for April 10 in which the first witness was to be Alfredo Cristiani, El Salvador's president at the time of the Jesuit murders. Last week, however, the judge postponed that hearing, indicating that he will first consider arguments from the defendants as to why the case should not proceed. The question of what Cristiani knew and when he knew it is one of the largely unanswered questions of the Jesuit massacre case. Cristiani reportedly told author Jorge Galan in an interview that high military officers were responsible for ordering the murders. In December 2017, former Colonel Inocente Montano, gave a declaration which implicated Cristiani in meetings on the day of the killings. The declaration was given in the parallel human rights trial happening in Spain where Montano is also attempting to downplay any involvement which he himself had in the planning of the massacre. Cristiani has said he does not know why Montano would attempt to involve Cristiani in the Jesuits massacre. The transcript of Montano's declaration, and a link to the audio of his words is available here. Montano is the only defendant currently in Spain after he was extradited from the US. The remaining defendants in the Spanish case remain safely protected by Salvadoran courts from being sent to Spain. 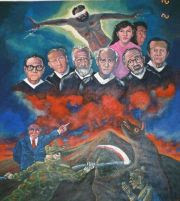 María Cidón Kiernan writes in RevistaFactum that the case of the Jesuits in a Salvadoran court puts to the test the willingness and ability of the current Salvadoran attorney general Douglas Meléndez, to prosecute an emblematic case of human rights violations from El Salvador's civil war. Whether Meléndez will be in a position to continue to prosecute the case is yet to be seen. His term expires this year, and he will need to be re-elected by the new legislators in the National Assembly if he is to continue.